Who told the Nigerian Football Federation (NFF) that he needs one? Nigeria head coach, Stephen Keshi, has refused an offer of a foreign assistant ahead of the 2014 Fifa World Cup in Brazil this June. The Nigeria Football Federation (NFF) had met with the current African Coach of the Year recently and proposed a foreign assistant to him which he turned down. The football federation even proposed to Keshi to pick any foreign assistant of his choice and it will foot the expenses including the salaries. Instead Keshi, 52, demanded that the Nigeria football house reinstate one of his former assistants and former teammates, Sylvanus Okpala, who was sacked after the Super Eagles won the 2013 Africa Cup of Nations in South Africa. “Stephen Keshi was offered the chance to choose a foreign assistant, who will work under him but he made it clear he was fine with his current assistants and backroom staff. The federation did this because they felt Keshi needed additional assistant. “But Keshi said he wanted one of his assistants, Sylvanus Okpala, to be recalled. The federation told him Okpala can’t be recalled because he was sacked for insubordination,” spokesman of the NFF Technical Committee, Paul Bassey, said on a television programme on Wednesday. 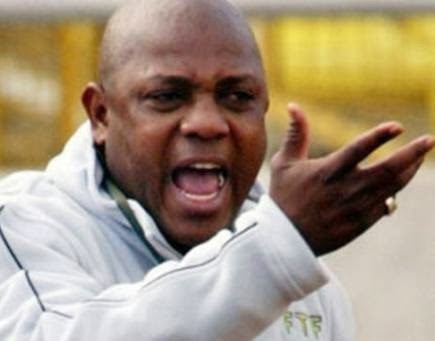 Keshi is currently working with Daniel Amokachi, Ike Shorunmu and Valere Houandinou as his assistants.